When I started writing my post series about the HST (which will be continued soon), I got an email from Zolt Levay from STScI in Baltimore (Space Science Institute, ‘Hubble headquarters’) about how the beautiful HST images are actually made there. We then decided that he would write this up as one of the posts here and we would post it once the GalaxyZoo: Hubble explanations are online on how those special images are made. Now that this has happened, it is time to posts Zolt’s much more general post here. Thanks to Boris for inviting me as a guest blogger here. I have been fortunate to be able to work on the Hubble Space Telescope mission for quite some time. I have spent a lot of that time working with Hubble images. I wanted to use this opportunity to say a few words about how Hubble’s pictures come about. Along the way I hope to give a flavor of the sorts of choices we make to present the pictures in the best possible way, to answer some questions and to correct some possible misconceptions. The images we see from Hubble and other observatories are a fortunate by-product of data and analysis intended to do science. Hubble’s images are especially high quality because they don’t suffer the distorting effects of the atmosphere since Hubble is orbiting high above the Earth. I won’t go into a lot more detail about Hubble’s technology since Boris has described that nicely in his post “Why build the Hubble Space Telescope?“. We do aim to produce images that are visually interesting and that reproduce as much as possible of the information in the data. I should also say that these techniques are not unique to Hubble. The cameras used at every large telescope operate pretty much the same way and the same techniques are used to produce color images for the public. We begin with digital images from Hubble’s cameras, which are built for science analysis. The cameras produce only black and white images because they are designed to make the most precise numerical measurements. They do include a selection of filters which allow astronomers to isolate a specific range of wavelengths from the whole spectrum of light entering the telescope. The black & white (or grayscale) data include no color information other than the range of wavelengths/colors transmitted by the filter. By assigning color and combining images taken through different filters, we can reconstruct a color picture. Every digital camera does this, though it happens automatically in the most cameras’ hardware and software. We produce color images using a three-color system that reflects the way our eyes perceive color. Most of the colors we can see can be reproduced by a combination of three “additive primary” colors: red, green and blue. Every color technology depends on this technique with some variations: digital cameras, television and computer displays, color film (remember that? ), printing on paper, etc. 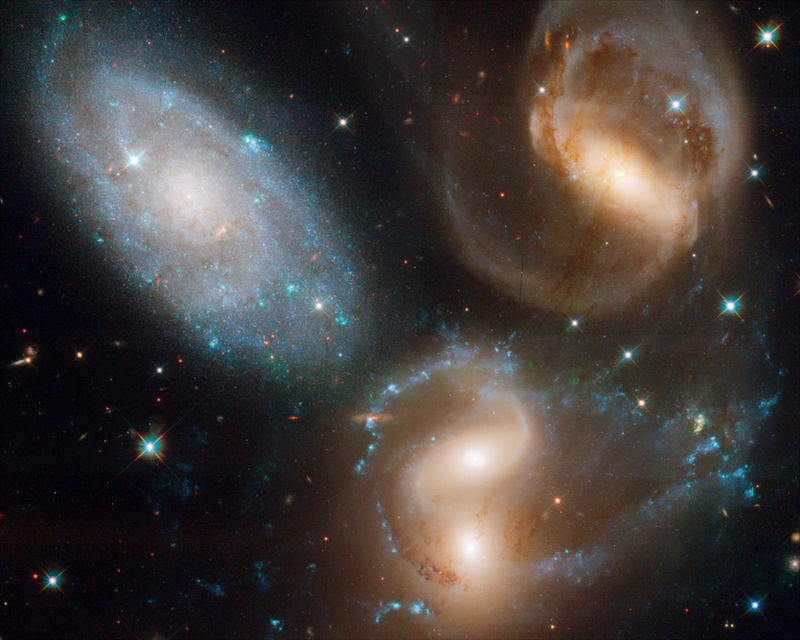 Here are three images of the group of galaxies known as Stephan’s Quintet from Hubble’s new Wide Field Camera 3 (WFC3). The three exposures were made through different filters: I-band, transmitting red and near-infrared light (approximately 814nm in wavelength); V-band (yellow/green, 555nm), and B-band (blue, 435nm). It may not be obvious, but if you examine the image closely you can see there are differences between them. The spiral arms of the galaxies are more pronounced in the B image while the central bulges are smoother and brighter in the I. We can then assign a color (or hue) to each image. Two things mainly drive which colors we choose: the color of the filter used to take the exposure and the colors available in the three-color model. In this case we assign red to the I-band or reddest image, green to the V-band, and blue to the B-band or bluest image, which are pretty close to the visible colors of the filters. When we combine the separate color images, the full color image is reconstructed. Because the colors we assigned are not too different from the visible colors of the filters, the resulting image is fairly close to what we might see directly. At least the colors that appear are consistent with the physical processes going on in the galaxies. The spiral arms trace regions of young, hot stars that shine with mostly blue light. The disks and central bulges of the galaxies are mostly made up of older, cooler stars that shine more in red light. Individual brighter stars — foreground stars in our own galaxy — show different colors based on their temperatures: cooler stars are redder, hotter stars are bluer. We can apply some adjustments to make the picture more snappy and colorful, similar to what any photographer would do to improve the look of their photos. We also touch up some features resulting from the telescope and camera; that explanation may be something that can waits for another post. Depending on the selection of filters — driven by science goals — and color choices, the images can be shown in various ways. But the motivation behind these and other subjective choices is always to show the maximum information that is inherent in the science data, and to make an attractive image, but also to remain faithful to the underlying observations. We don’t need to heavily process the images; they are spectacular not so much because of how they are processed, but because they are made from the best visible-light astronomy data available. A variation on this image blending technique needs to be applied with filters that don’t correspond to the standard color model. Narrow-band filters are designed to sample the light emitted by particular elements (hydrogen, oxygen, sulfur, etc.) at specific physical conditions of temperature, density and radiation. 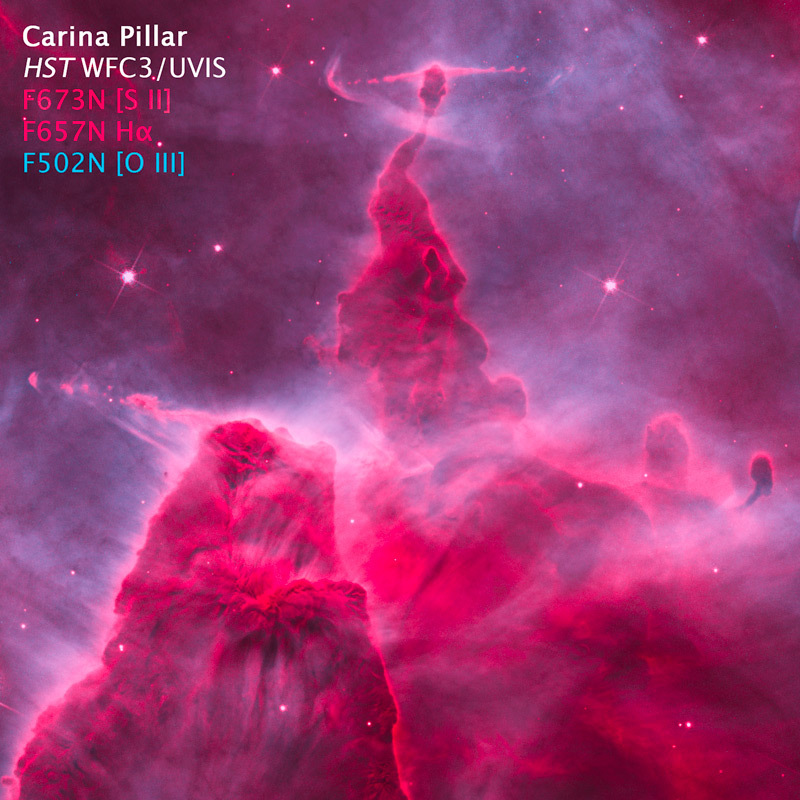 These filters are used mostly to observe and study nebulae, clouds of gas and dust that glow because they are illuminated by strong radiation from nearby stars. This very diffuse gas emits light at very, narrow ranges of wavelengths so the color can be very strong or saturated. Some of the most spectacular images result from these clouds that come in all sorts of shapes and textures. The wrinkle with this sort of observation is that the colors of the filters rarely match the primary colors we would like to use to reconstruct the images. We can choose to reconstruct the color image either by applying the color of the filter, by using the standard primaries or something else entirely. In general a more interesting image results from shifting some of the filter colors. The resulting colors are definitely not what we might see live through a telescope, but they do represent real physical properties of the target. 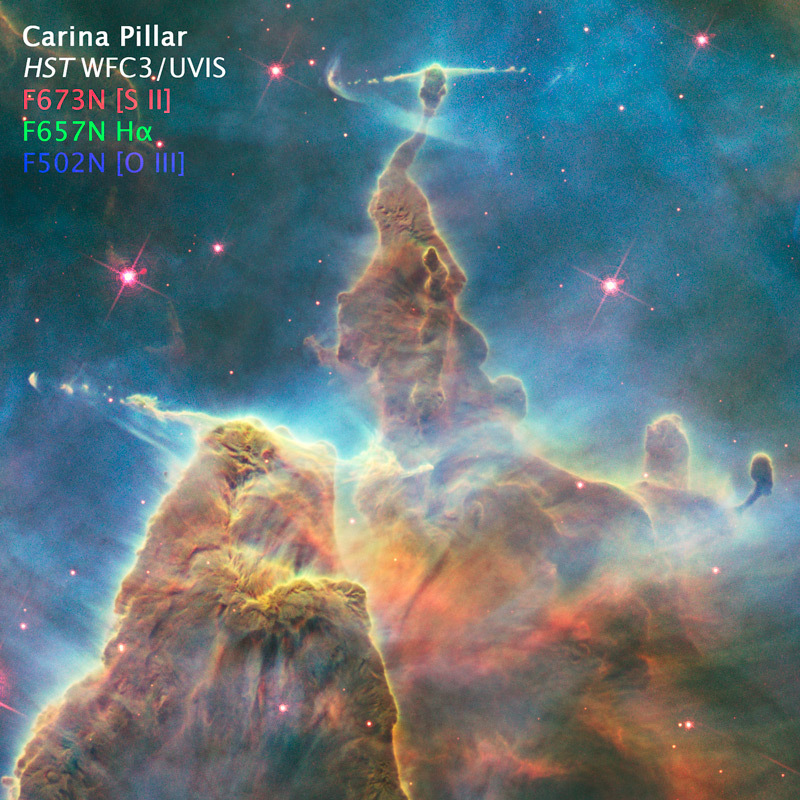 Here are some images of a pillar in the Carina Nebula, taken to celebrate Hubble’s 20th anniversary in 2010. The filters sample light emitted by atoms of hydrogen, sulfur and oxygen. The hydrogen and sulfur both emit red light and the oxygen is cyan (blue-green). The colors and brightness of emission from the various elements depends on the physical conditions in the nebula such as temperature and pressure, as well as the quantity and energy of radiation from surrounding stars causing the clouds shine. Here we are using red for the sulfur (the reddest, longest wavelength filter), green for the hydrogen and blue for the oxygen. It may be a little disconcerting; many people know that hydrogen usually shines in red light, but here we are showing it in green. But sulfur also shines in red light here, so the only way to visualize the structures that result from differences between the hydrogen and sulfur is to shift the colors. If we make the color composite in this way though, see that we now have a fuller range of colors, like an artist’s palette with many more different paint colors. The combinations of colors (like mixed paints) in the composite image result from real differences between the emission coming from the various elements. If they are rendered in the same color those differences are eliminated in the composite. But if we separate their rendered colors, we can show more of the information inherent in the data. Thanks again for the opportunity to contribute here. I hope this answers some questions about where Hubble’s color images come from. We all hope that Hubble continues beyond its extraordinary 20+ years of amazing science and we can see even more spectacular cosmic landscapes. At Zoo headquarters we like to be efficient. That means avoiding redoing work that has already been done by someone else. Particularly if those others have already spent a long time thinking how to do it best. Getting the images for the original Galaxy Zoo (way back in 2007!) was particularly easy. The fabulous Sloan Digital Sky Survey (SDSS) had already done all the work of taking the images, calibrating them, stitching them together, combining images at different wavelengths to make colour images, and optimising their appearance. All we had to do was ask their servers for an image, giving it the required location and size, and voilà, a image ready for adding straight into the Galaxy Zoo collection! Life was rather more difficult when we added the special ‘Stripe 82’ images from the SDSS. For these, Galaxy Zoo team member Edd needed to do the stitching, combining, optimising, cutting-out and resizing. The details of how he did that are all here. We wanted to be able to compare the Stripe 82 images to the normal SDSS images, so we tried to keep things like the brightness scaling and appearance of colours as similar to the original as possible. Even so, it took us a couple of attempts to come up with a solution we were satisfied with. We’ve also recently added in COSMOS: Cosmic Evolution Survey images – more about the nitty gritty details of those images in a future post. The data calibration business was already taken care of by the science teams for each survey. The next steps, finding the galaxies, cutting out images at each available wavelength and combining them into colour images, was handled by Roger Griffith, who already had a system set up to do exactly that. Roger used a nifty piece of software called GALAPAGOS to manage the business of finding, cutting out and measuring the galaxies. The difference that Galaxy Zoo added to Roger’s system was that, like with Stripe 82, we wanted the properties of the colour images to match those from SDSS as closely as feasible, to enable us to compare the results from each of the Galaxy Zoo datasets as fairly as possible. One particular issue with making colour HST images is that many surveys only produce data at two different wavelengths. Normally, colour images are made by choosing a different wavelength image for each of the three primary colours: red, green and blue. For the HST images we instead use one image for red, another for blue, and then just take the average of the two for green. The primary colours used in your computer display don’t usually match the colour filters that were used in the telescope at all, so the colours you see are only an indication of the true colour. Nevertheless the colours contain a lot of information: galaxies containing only old stars will look red, while those which are actively forming new stars will often be blue. Getting the images looking right, with fairly similar appearance to the SDSS images, required a cycle of testing and exchanging images back and forth, but we came to an agreement fairly quickly. The HST images in Galaxy Zoo might not look as impressive as some of the press images you’ve seen from Hubble over the past twenty years. That’s because press images are usually picked specifically for their attractive appearance. The images chosen are often of nearby nebulae and galaxies for which HST allows us to see huge amounts of detail. The objects in Galaxy Zoo: Hubble are much more typical of the huge number of galaxies in HST surveys. Although HST can see much more detail than ground-based surveys, its mirror and field-of-view are smaller than most ground-based telescopes, so it can only cover a much smaller area of the sky in a reasonable amount of time. Surveys with the HST therefore focus on faint, distant galaxies, so we end up with images having similar quality to those from SDSS, which is remarkable given how much further away the HST galaxies are compared with those from SDSS. The similarity between the images of galaxies in the early universe from HST and those relatively nearby from SDSS is actually a big advantage. It means that we can fairly compare the morphologies of galaxies at these two eras in the Universe’s history. That’s what professional astronomers will be doing with your Galaxy Zoo: Hubble classifications over the coming year. The final in our series of Zooniverse project posters, created from the names of contributors, is Galaxy Zoo Mergers. The posters features an image of the Antennae Galaxies made up of the names of the 13,000 mergers participants who agreed to have their names published. You can download the large, 5000-pixel version (15 MB) or the smaller 3,000-pixel version (6 MB). New content. New images. A refreshed Galaxy Zoo. Along with bringing you new content, we’re also bringing you new images! Through your combined efforts, you’ve classified your way through the Hubble Space Telescope’s GOODS, GEMS and AEGIS images. This means it’s time for new images! Today we’re introducing to Galaxy Zoo a large batch of images from COSMOS: The Cosmic Evolution Survey. These images, taken during 590 orbits of the Hubble Space Telescope, map out a 2 square-degree region of the sky. While tiny compared to the area of the Sloan Digital Sky Survey, these images are sensitive enough to see objects almost 100 times fainter! (For those of you wanting the numbers, SDSS gets to i = 22.3, while COSMOS gets to I > 27!) These images have been used to map out the distribution of dark matter and the large-scale structure of the universe. Now, thanks to you, these images can extend our understanding of galaxy morphology out to more distant galaxies and down to fainter nearby galaxies. Day 22: Galaxies and Content, these are our gifts to you. And more will be coming. The content we have up today isn’t comprehensive: it’s a base layer that will be growing over time. As you search for content, we’ll track what you search for and add needed content. As the Zooniverse continues to discover new things – as you discover new things – we’ll work to add that content too. For advent, we offer you a chance to start learning about galaxies on the Galaxy Zoo website, and we’ll work to make it possible for you to keep learning in the times to come. In addition to adding content to Galaxy Zoo, we also added a set of quiz questions. This your chance to test your knowledge of galaxy related concepts, one question a day. Any of you who have used Moon Zoo (which should be all of you – really, if you haven’t already, go try it out at http://www.moonzoo.org) have seen these types of questions before. Just as we use your responses to the classification tasks to do astronomy research, we use your responses to these quiz questions to do learning research. When you answer these questions, we’ll tell you if you got them right or wrong, but because you may see the questions again (and because that friend or family member looking over your shoulder may see the question later), we can’t explain the right answer if you get the question wrong. This is only a temporary problem however. After we get enough data (sadly, this may take a year) to see what you are learning, we will post all the answers in Explore Galaxies. On this 22nd day of Advent, our gift to you is information. Please: go read, go learn, go search, and know that more content is coming as we learn what you want to know (and let us know what you do know by answering the once a day quiz questions). The 19th door opened of the Zooniverse Advent Calendar leads us to M51, the beautiful Whirlpool Galaxy, taken on the SDSS telescope that we used for Galaxy Zoos 1 and 2. For a few days after 25th November, the Galaxy Zoo Forum nominated their favourite galactic images from the thousands gathered over our three and a half years of existence, and voted on 48 of them. Here was the selection – as you see, it was a tough choice! The winner was the stunning blue spiral, merging with a yellow galaxy so torn apart by gravitational forces that it would be hard to classify! M51 is 33 million light years away and so bright that it has potential to fry the SDSS camera’s delicate optical instruments – so SDSS avoided looking at it too directly. Therefore, it has no reference number; but you can go into its pages and move up, down, right and left by adjusting the RA and DEC until you can more or less centre in on it. M51 was discovered by Charles Messier, and put into his collection of objects that he thought were pain-in-the-neck smudges giving him false hopes of having discovered a comet! Jules wrote an Object of the Day about him and some of our other Messier Objects on the forum here. The pair of galaxies are also known as NGC 5194 and 5195. I’ve seen them described as 23 million, 31 million and 33 million light years away. The spiral is large, and famous for its dust lanes and intense star formation. You can resolve it in dark skies with a good pair of binoculars; it’s in the constellation Canes Venatici, though you find it just south-west of the brightest star of the Plough’s “saucepan handle”. You can see a great deal more of this gorgeous object at Hubblesite, Astrocruise, NOAO and four different views altogether (and probably quite a few more) on APOD! The SDSS Telescope also has it proudly displayed on its home page, with a caption if you zoom in. It won by only 1 vote; many other galaxies got almost as many. We’ve had plenty of time at Galaxy Zoo now to decide which galaxies we love best . . . and the answer is quite often “all of them”. M51 has never had any special attention on the forum that I recall, though it has of course had its fair share of admiration. I guess there are just too many things there to love! A galactically happy Christmas to all our zooites from our oldest Zooniverse project. Of the many things that the Zooniverse produced this year (2010 was a busy one!) a highlight for me were the Zooniverse limericks over on the Galaxy Zoo forum. For Day 17 of the advent calendar I have picked out a few of my favourites. Crowd-sourced and often puntastic. Despatch them, and earn zoo divinity. a whisper of infrared peaks. The IAU voted to can it. And some edge-ons are simply a mess! I’m a LADY. Tis true! Ask these folk!! There are plenty more on the enormous limericks thread! 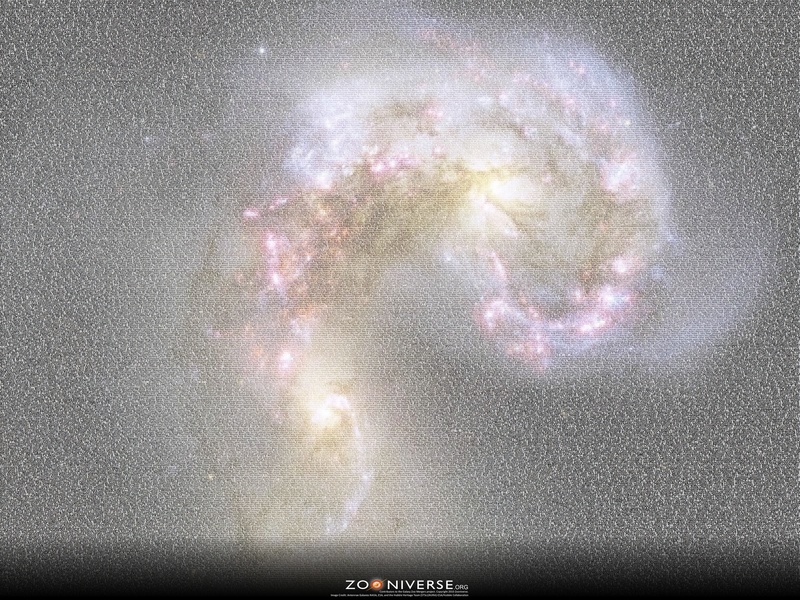 The Galaxy Zoo forum is a hub of activity in the Zooniverse. they talk about everything from merging galaxies, to supernovae and even tea and biscuits. Compared to these tea-drinking stalwarts of the Zooniverse community, I am a relative newcomer. I often wonder what they talk about for ages amongst those many forum sections and threads. For the Zooniverse Advent Calendar I thought I would find out – in the process I made a Christmas card for the forum! I have taken every word from every forum posting of 2010 (over 100,000 posts) and given it to the Tagxedo website. 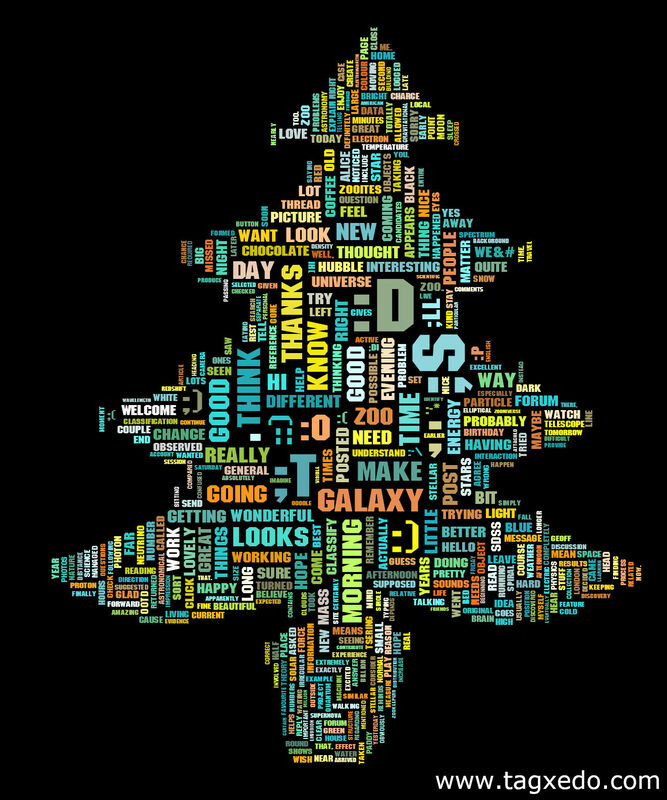 The result is this lovely Christmas tree made up of all the most popular words used in the Galaxy Zoo forum. 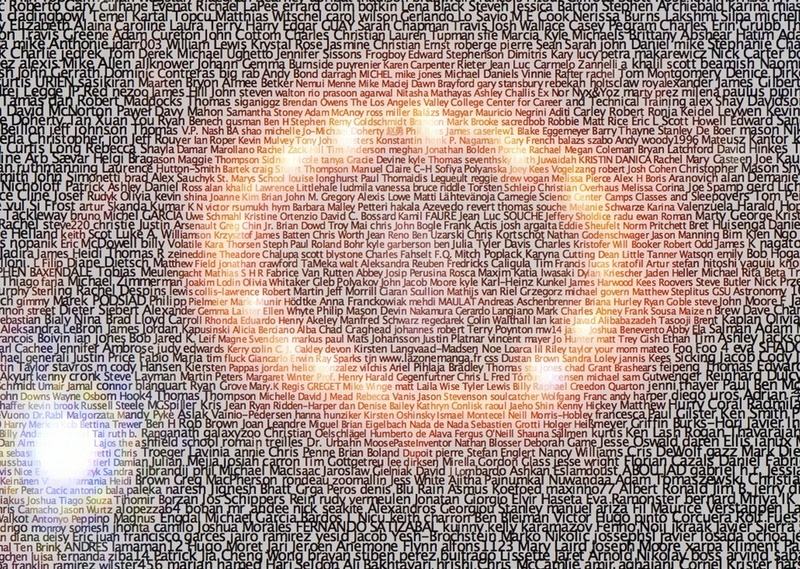 The size of the words shows their popularity, and only the 600 most popular words are shown in the image. You’ll not surprised to see words like ‘galaxy’, ‘hubble’ and ‘universe’ in there. You might be more amused by the inordinate number of smilies that decorate the tree. I enjoyed the random alignment of the words ‘think different’ – which seemed very appropriate. You can also see the names of many of the forum’s more active members as well as words such as ‘friendship’, ‘welcome’ and ‘love’. You can grab the image in 16 megapixel and 4 megapixel formats. Merry Christmas to our forum zooites! For day one of the Zooniverse Advent Calendar we finally gave you the Galaxy Zoo 2 Author Poster. That project is complete, but there’s no reason we shouldn’t create similar thank-yous for the other Zooniverse projects. So here is the Galaxy Zoo: Supernova Author Poster! 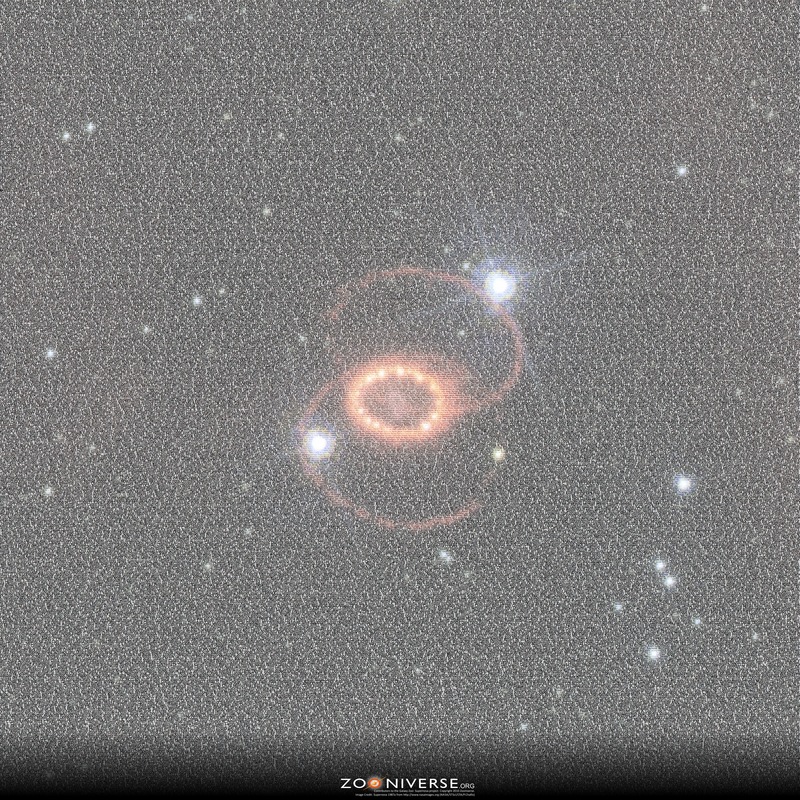 13,400 individuals, who have taken part in the Supernova project to date, merged into an amazing image of the famous supernova 1987a. You can download the largest size (18MB), or the 2500-pixels version (6MB). There is also an equivalent author page on the Supernova website.